Well, i’m in my third week in this new flat, and ever since i moved in, there has been this loud, irritating CHIRP echoing down the stairway, from up at the extreme top of the house, it’s from an old smoke alarm, and it’s been driving me nuts since i moved in, and it’s so loud, it’s easily heard inside the bottom floor flat..
just like it’s supposed to be. 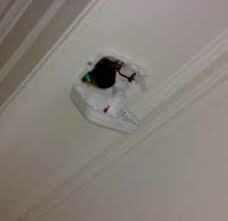 However, the battery was in need of replacement, but as a ‘proper’ smoke detection system was fitted afterwards, no-one bothered to remove this temporary detector. I’m not even sure how long it had been beeping away, but it was irritating beyond belief, every 30 seconds or so, all day, all night, i think the other residents had grown immune to it, but i hadn’t. and i didn’t want to either. I have good hearing. Maybe it was a side-effect of the gas-leaks i had suffered earlier in the week 🙂 or maybe it was just a pique of (correctly directed) rage, but last week I’d had enough, and i was feeling quite poorly and so i decided that it was time to bring doom to this errant audio torture device, it was either ‘it’ or me. There could only be one winner. Problem was, the damn thing was about 15ft or 20 ft out of reach, and naturally, I had no ladders.. so what to do ? well i remembered i had a 18ft CB aeriel i never got ’round to using, so this was unpacked and fitted with various implements, but with several cable ties and gaffa tape, eventually ended up brandishing a blunt kitchen butter knife, and the plan was, of course, to direct much hatred towards this infernal device and save and restore the sanity of myself and the others in the building. First i needed to know if it really was a battery powered unit or wired.. the fire alarm inspection Guy said it was battery operated, (and that it wasn’t his job to ‘fix it – Thanks Hitler) anyway, as i am aweare of sods law, i remembered that it’s always wise to check for yourself before proceeding. For a few minutes i turned into a caveman and ended up just poking (alright, hitting) the thing with the long metal pole i had fashioned, but it was far too clumsy an exersize, but it felt good though. A new approach was needed, and i asked my friend upstairs that if he heard a commotion just out of his doorway, to not worry as i was only attempting moderate violence, and i was glad when he appeared to assist, as there we were, both laughing at my feeble attempts to lever the door off.. my eyesight is poor also, so i needed help. It must have seemed like a promising venture somehow, as a cell phone with a zoom was pressed into service, which helped a little, but we needed more, then your mate steps up – with a pair of binoculars. Excellent. I manged to flip the cover of the evil smoke detector thing open, and great news, the binoculars revealed to my mate Vinni (who was now on binocular duty) that the device was indeed battery powered, so i figured it was safe to proceed as 240v was nowhere to be seen. I was even more impresed as he read the inspection date sticker out on the alarm and also spotted the pp3 battery clip. nice job. The damn thing would, of course, not lever off the ceiling, and i didn’t want to scrape the decoration or i would end up using the same metal pole for distance-plastering then distance-painting, and i didn’t fancy that, as the knife on the pole was bent over at 90 degrees, to make a ‘prizing things off the wall’ hook thingy, anyway.. i got the taste for blood by now.. i felt revenge was in the air.. not gas. An attempt to prise the pp3 clip off the distant smoke alarms’ tired battery was attempted many times, but failed miserably, as at about 15ft away, and with another human having the visual feedback… it was unlikely to succeed anytime soon. It would be easier trying to type with knitting needles while blindfolded.. so an executive decision was made to just hook the red & blue wires and use violence. This eventually worked. It felt good. A hushed calm descended through the house, which was slightly un-nerving at first as our brains all tried to figure out what had happened to this noise, and how to re-insert the missing holes of reality that they had been blocking out every 30 seconds. It almost seemed wrong.. like something was lost almost.. The silence.. i noticed other things that i had not heard before, things which previously my brain was ignoring too, like it was trying not to listen. I thought if only i could block out the rest of the audio pollution quite as easily. Almost since moved in here I had to have the AC fan running 24/7 here, and i always shut the doors ’round the place too, in an attempt to attenuate the beeping noise. Maybe as a musician i’m a little more sensitive to sound. So glad we that got sorted though, I find it quite easy in this kind of weather to have the mains powered fan running constantly as when i was being subjected to the 2 weeks of beeping, it acted like a kind of real world ‘noise gate’ – as with the interior doors closed, there was no beeping heard at all, and now, it cools the room down to comfortable levels.. and it’s cool, peaceful, and leaves me free to plan on getting some aeriels up here .. oh, and the other stuff you plan to do when you’re a geek in a new place..
July 1, 2015 / Author: Hax / Posted in: The Hot Air Machine..